In a traditional setup, a camera needs two lenses spaced about as far apart as a pair of eyeballs to take a 3D image. The photo taken through each lens represents a visual "channel"--one right channel, one left channel--that sync up with your eyeballs to create the 3D illusion you see in the resulting image. After taking the two photos, the camera combines the two "channel" images into one image in various ways, depending on the playback technology. Slightly offsetting the two images or firing the left- and right-channel images in rapid succession gives the image or video simulated depth when viewed with special eyewear or on a specially coated display. Few single-lens 3D cameras and convertible 3D lens options are available now, though they are still probably the best option for casual shooters today. Not everyone wants to invest in a twin-lens camera built primarily for 3D shooting; one-lens cameras are everyday models built for traditional 2D shooting, but they also let you experiment with 3D photography. Be aware, however, that single-lens cameras can take only 3D still images, not 3D video footage; you'll need a dual-lens device to make 3D movies. Inside single-lens models, accelerometers and algorithms perform most of the magic. The cameras detect where each lens in a two-lens setup should be; then on-screen guides instruct the shooter to move the camera accordingly to frame a 3D shot. The camera performs the post-shot stitching and processing automatically, and the result is a single .MPO-format 3D image. 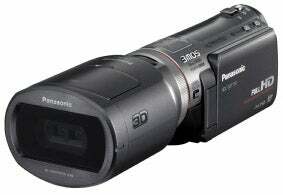 Single-lens 3D cameras: The major players in one-lens, casual 3D shooting are Olympus, Panasonic and Sony. All those companies now offer several single-lens point-and-shoot cameras that capture.MPO images in 3D. In general, the 3D effects aren't as stunning as you'll see with a traditional twin-lens setup, but the cameras provide convenient entry points into 3D. Panasonic just announced three new Lumix cameras that pack a similar 3D-shooting mode. The 16X-optical-zoom Lumix ZS10, the ultraslim touchscreen-operated Lumix FX78, and the rugged Lumix TS3 have a side-to-side panning 3D mode similar to the one found in Sony's cameras. Of the three, the TS3 is also ruggedized and lets you take underwater 3D shots. Conversion lenses for 2D cameras and camcorders: Panasonic's entries for 3D still and video capture use detachable twin-lens 3D converters, making them good options for anyone who wants to dabble in 3D. The Lumix GH-FT012 (12.5mm, f/12) lens works with Panasonic's interchangeable-lens Micro Four-Thirds Lumix DMC-GH2, GF2, and G2 cameras. With the lens attached, each camera snaps two side-by-side 3-megapixel images, and then combines them in the camera to create a single .MPO-format image. The lens, sold separately from the cameras, costs $250. Meanwhile, Panasonic has six new camcorders that support the VW-CLT1 3D Conversion Lens introduced with last year's groundbreaking HDC-SDT750 camcorder. The HDC-HS900, HDC-SD90, HDC-SD800, HDC-SD900, HDC-TM90, and HDC-TM900 are compact high-definition camcorders that shoot 960-by-1080 video with each lens when the separately sold 3D lens is attached. It uses "side by side" technology to display the video in 3D during playback, which stretches the 960-line-wide horizontal resolution of each visual channel across the full 1920-line resolution of a 1080p HDTV screen. This entails a downgrade in resolution when you play back video in 3D. Theoretically, twin-lens setups can shoot both 3D stills and 3D video, but Panasonic's cameras and camcorders do one or the other (but not both) with their 3D conversion lenses: The G-series cameras take 3D still images with the conversion lens attached, and the camcorders shoot 3D video with their conversion lens attached. 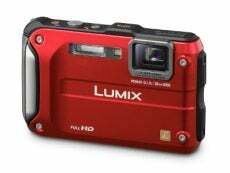 Dual-lens 3D cameras and camcorders: Currently there are four major options for fixed-dual-lens, "3D-first" models. All of them capture traditional 2D images, too, but they're designed primarily as 3D cameras and camcorders. The most advanced compact camera in the 3D realm is the Fujifilm FinePix Real 3D W3 ($500), the company's second-generation 3D snapshooter. The W3 has two 3X optical zoom lenses and two 10-megapixel sensors, plus a lenticular display that lets you see 3D effects without having to wear special glasses. The W3 offers manual controls for each lens, as well as some advanced 3D shooting modes that separate it from single-lens 3D cameras; you can also use manual controls to tweak the 3D effect of its 3.5-inch display. 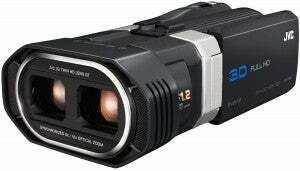 It shoots 3D stills in .MPO format, and 720p 3D video in 3D-AVI format. Playback works well when the camera is connected to a 3D TV via HDMI, but no existing 3D TV natively supports the 3D-AVI format. Announced at this year's CES, JVC's dual-lens 3D camcorder, the JVC GS-TD1 ($2000), has two ultra-bright f/1.2 lenses in front of two backside-illuminated CMOS sensors that capture 1920-by-1080-resolution full-HD footage out of each channel in AVCHD (.MTS) format; the camcorder also snaps .MPO-format 3D stills, using its two 3.3-megapixel CMOS sensors. You can view 3D footage as you capture it without glasses, thanks to an adjustable parallax-barrier 3.5-inch LCD screen, and the camcorder supports 3D playback at full resolution. According to JVC, video playback is officially supported only when you use the camcorder as a playback device, connected to a compatible 3D TV set via HDMI. 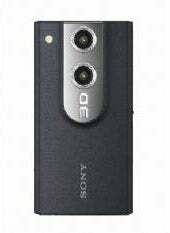 Sony is another major player in the 3D camcorder realm, with a high-end full-size camcorder and a 3D-capable pocket camcorder on tap for 2011. 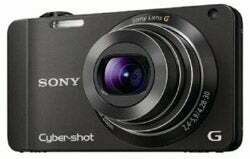 The Sony Handycam TD10 ($1500) captures left-channel and right-channel 1920-by-1080 MPEG-4 MVC video, displayed in full 1080p resolution during playback. Instead of using "side-by-side" 3D technology, the TD10 uses "frame-packing" 3D, which displays full-resolution video captured from each lens. It has a 3.5-inch glasses-free 3D display that uses parallax-barrier technology, and it handles 3D video playback by using the camcorder as a playback device, connected via HDMI to a 3D TV. The pocketable Sony Bloggie 3D ($250) has two lenses and two CMOS sensors; 3D shooting requires tilting the camcorder to landscape orientation while recording. The Bloggie 3D shoots 1920-by-1080-resolution MPEG-4 video through each channel, as well as 2-megapixel 3D still images. Video playback uses the side-by-side 3D display method, so 3D video clips lose a bit of resolution. 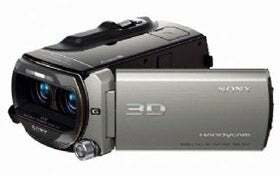 The pocket camcorder has a glasses-free 2.4-inch LCD display for viewing 3D footage on the device; playback on a 3D TV requires connecting the device to a set via HDMI.